To remove an item, drag it to the Trash. The Trash is located at the end of the Dock. When you see a warning message, click OK. 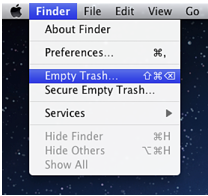 Tip: To prevent the warning message from appearing, press the Option key when you choose Empty Trash. You can also turn off the warning in the Advanced pane of Finder preferences. You can also use Disk Utility to securely remove items from your computer.